Mr. Lawrence is the Chair of the firm’s Financial Institutions Industry Team and a member of the Real Estate department. 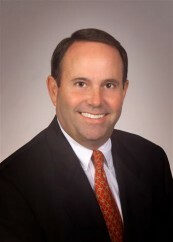 He has more than 30 years of experience in commercial real estate transactions, commercial lending, loan workouts and secured and unsecured loan transactions. He has represented numerous banks and borrowers by structuring a variety of commercial lending transactions, including real estate acquisition and development loans, agribusiness loans, and lines of credit to national home builders and other developers. Mr. Lawrence was recognized by the nationally-renowned BTI Consulting Group among the 2011 BTI Client Service All-Stars. Honorees are recognized for their exceptional dedication to client service, solely based on unsolicited feedback from more than 300 corporate counsel in large and Fortune 1000 companies throughout the United States.